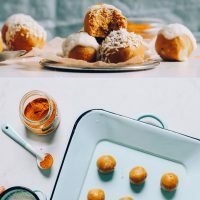 These 5-ingredient balls are packed with warming, anti-inflammatory spices like turmeric and ginger, naturally sweetened with maple syrup, grain- and gluten-free, and come together in about 20 minutes. Oh, and don’t forget the optional coconut butter swirl and “frosting.” Swoon! 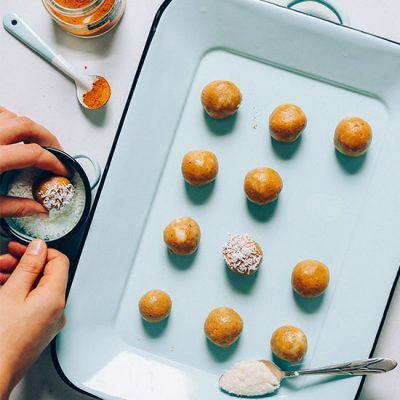 These snack bites start with creamy cashew butter, which I consider one of the more neutral and creamy nut butters, making it an ideal base for this recipe. Need to avoid nuts? Check the ingredients section below for substitution ideas. Next comes a heaping spoonful of my Golden Milk Mix for that warming golden milk flavor, and a sprinkle of hemp seeds for added protein and essential fatty acids. Maple syrup adds a bit of natural sweetness, and coconut flour creates a moldable dough with a little added sweetness and coconut flavor. 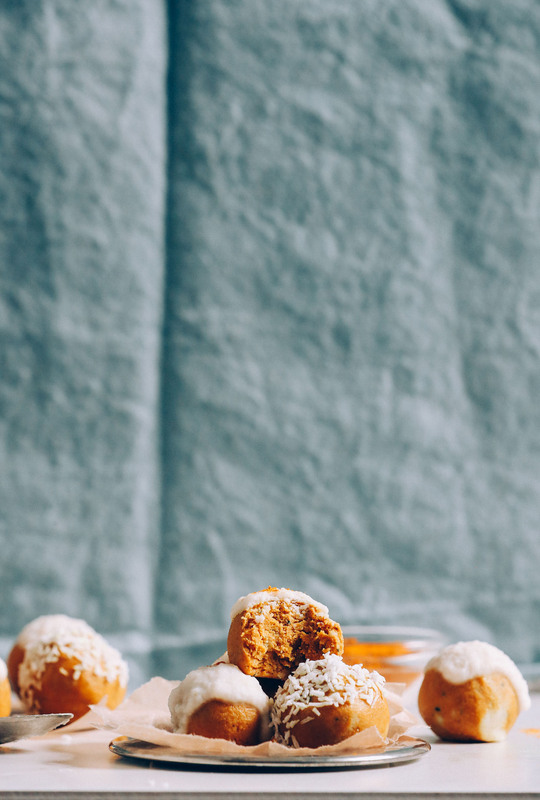 Next you can add a dollop of coconut butter for a coconut swirl (optional) and then roll into balls. Enjoy straight from the pan, or refrigerate to chill. I opted to “frost” these with melted coconut butter. But you could leave them plain or roll them in shredded coconut as well! These would make the perfect on-the-go snack or healthier treat. I’ve been enjoying one with a cup of hot tea in the afternoon—it’s the perfect pick-me-up. While coconut butter is a delicious “frosting,” I could also see a drizzle of melted dark chocolate making these even more indulgent if you want to serve them as dessert. Looking for more golden milk recipes? Check out our classic 5-Minute Vegan Golden Milk, Golden Milk Mix, Golden Milk Macaroons, and this fan favorite Golden Milk Smoothie! 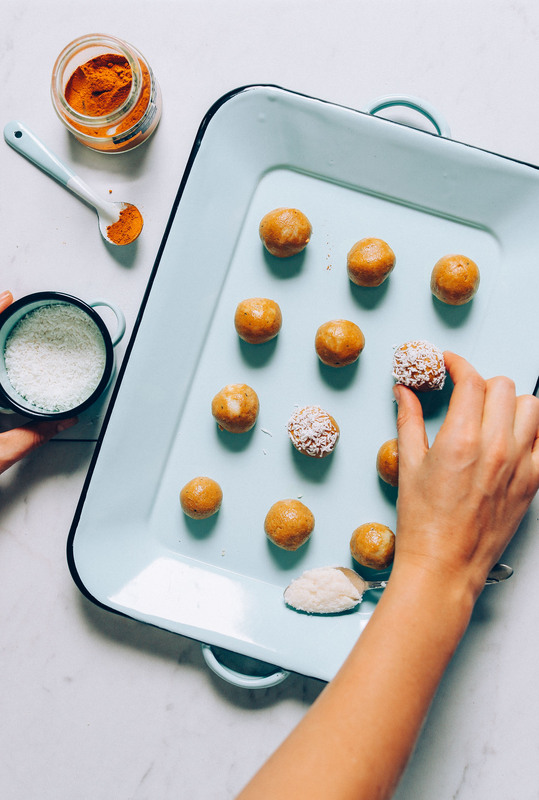 Quick and easy, 5-ingredient snack bites with cashew butter, coconut, anti-inflammatory golden milk spices, and naturally sweetened with maple syrup. 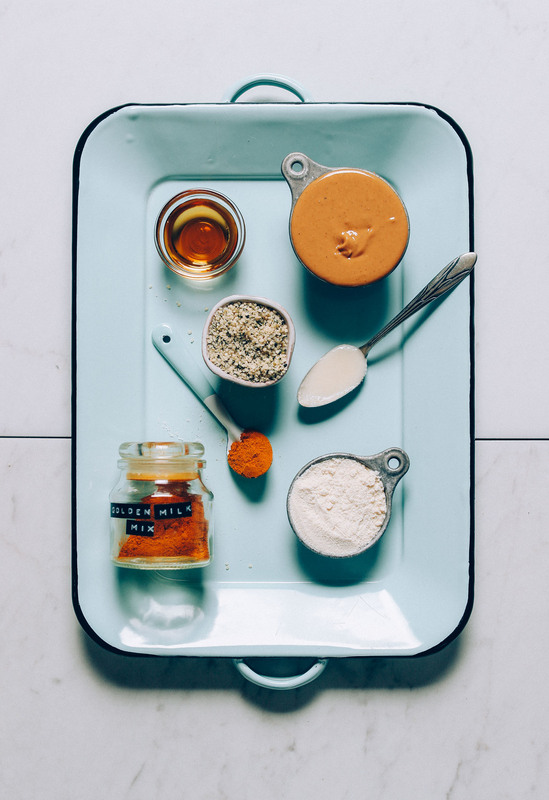 Add cashew butter to a medium mixing bowl along with maple syrup, hemp seeds, golden milk mix (or spices*), and salt (optional). Stir to combine. 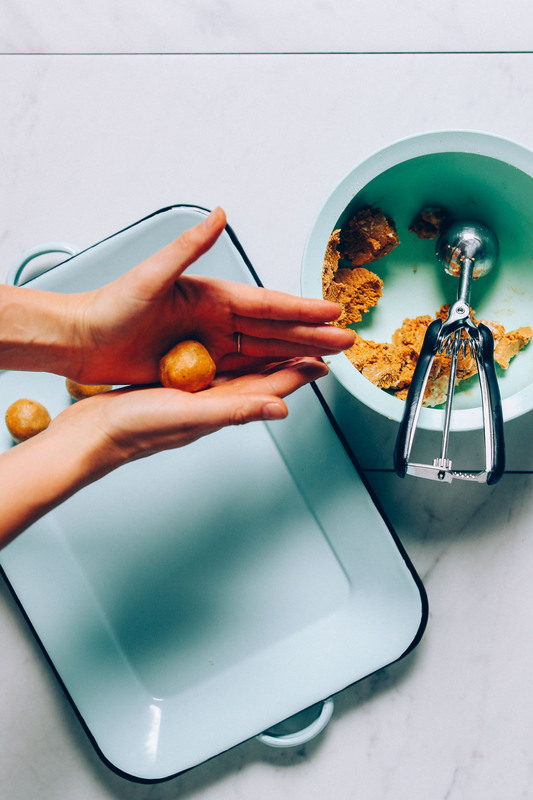 Add coconut flour a little at a time until a firm cookie dough consistency is reached—not tacky, not crumbly, and moldable into balls. Taste and adjust flavor as needed, adding more golden milk mix for spice/warmth, or maple syrup for sweetness. At this point you can add softened/melted coconut butter and stir loosely into the dough for a swirl effect (optional). Otherwise, skip this step. Scoop out 1 Tbsp amounts and gently roll into balls (as the recipe is written, there should be about 12). Repeat until all dough is formed into balls. Enjoy as is, roll in shredded coconut, or refrigerate for 10-15 minutes to chill. If desired, after chilling, top with warmed (melted) coconut butter (see photo), then chill again to set (about 10 minutes). Leftovers will keep stored in the refrigerator up to 1 week (sometimes longer), or in the freezer 1 month. *If using individual ground spices, add 2 tsp ground turmeric, 1/2 tsp ground ginger, 1/2 tsp ground cinnamon, 1/4 tsp ground black pepper, 1 pinch nutmeg (optional), 1 pinch clove (optional). Measurements are for recipe as written. Modify if adjusting serving size. *Check out a round-up of our favorite vanilla protein powders. Thank you for this recipe! I can’t have any milks right now but wanted to try the spice mix so badly. I used sunflower seed butter (avoiding nuts right now) and ground flax for hemp seeds as per someone else’s suggestion. I only needed 2 Tbsp of coconut flour since the 2Tbsp of ground flax stiffened up the dough considerably. For sweetness, I used date paste. I have not changed the measurements. I believe the magic is in your golden milk mix. I cannot get enough of it. I thought these turned out great! Will def make again and again … and again :) Made them with almond butter and subed vegan vanilla protein powder instead of hemp seeds. So yummy! I made these about 3 times last week 💛 a new favorite! So easy to stir together, no blender or food processor required, love that! Love this recipe! Added cardomom and used almond flour. Delicious!! Yum! We’re glad to hear that, Jem! Could cassava flour be used? I’m almost out of coconut flour. Hmm we haven’t tried and can’t say for sure. If you experiment with this recipe, report back on how it goes. Good luck! I made these recently for a party food for friends who have a very strict diet for health reasons. I used hazelnuts as they were what I have on hand and ground them to replace the cashew butter. We dipped them in enjoy life melted chips and everyone thought they were great. I’m enjoying the undipped leftovers. I enjoy being able to get the benenfits of golden milk without the millk. Thanks for a great recipe idea. These are absolutely delicious. I just love the spice combination, and I enjoy a different approach to consuming turmeric aside from either in the usual Indian/curry dishes or via a drink. I really enjoyed that I was able to put these together in a standard mixing bowl, as well. I’m so used to energy ball recipes requiring the use of my food processor (because they usually contain dates.) I even caught myself pulling out my food processor. Then I read the directions and said “Oh!” and put it back with some satisfaction. 3. While I was adding extra almond flour, I added a tablespoon of ground flax (in place of what would have been extra almond flour.) Did this just for the added omega 3’s. I also imagine they would be a decent replacement to the hemp hearts/protein powder if you wanted. These were absolutely delicious. I plan to make them again. Maybe trying it out with less expensive almond butter the next go-around, and probably leaving out the coconut butter (unless I make my own.) But that cashew butter really makes ’em good. Cashews are just naturally sweet so they work so good with this recipe. These look absolutely delectable!! Will definitely give the recipe a try! We hope you love them, Taylor! I am so making this tonight. I wonder how peanut butter would do here. I kinda feel like it would be too overpowering but might be a fun experiment!? Okay so I’ve made this twice and they were sooo good!! I did alter quite a few things though based on what I had. The first time I used sesame seeds instead of hemp seeds and oat flour instead of coconut (you do have to add a bit more but not much, maybe a tablespoon or so) and they turned out fantastic! So, I have a confession. When I made my last batch (with the almond flour and almond butter), I fell in love. So did my neighbors! The spice mixture was reminiscent of an Italian spice cookie from my childhood. I have tried many attempts to make it but it just wasn’t special enough. 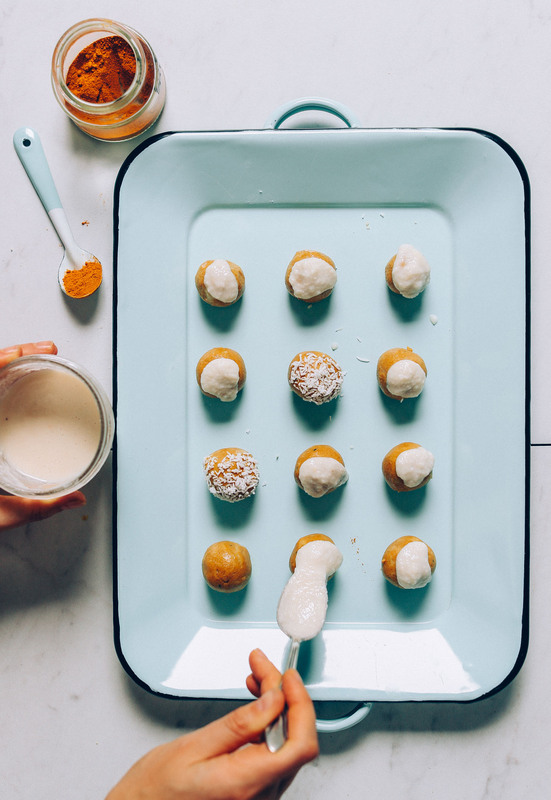 I followed your gold milk bites again (with the almond flour and almond butter). I added unsweetened cocoa, a bit more maple syrup and some small vegan chocolate chips. I also added more clove as that was the spice that peaked my memory. They came out sublime. Thanks, Dana for giving me a memory of my childhood! Sorry I need some clarification — I jumped over to your Golden Milk recipe and wanted to double check — when you say use my Golden Milk Mix do you mean dry ingredients or all the ingredients from the recipe — make it and then use in this recipe. Sorry… silly question I just wanted to check because it would be great if you could make the mix ahead and have on hand and just add the oils and milk when ready to have a glass. These look brilliant! Going to make them this weekend. Thanks for the post. Just made these yesterday – delicious and I love the texture! I kept it around 2.5 tbsp maple syrup and it was perfect. I plan to add cardamom to my next batch because I’m obsessed with it lately. Artisana brand raw cashew butter was great – no added sugar and nice and creamy! My first time using cashew butter and I’m a fan. Thanks for a great recipe! Bummer! We’ve been to Warsaw and loved it. Didn’t realize cashews were difficult to find there. Hopefully you’ll still be able to use the recipe in other variations! Of course, I may try with very popular peanut butter! And I think, that Poland is a very strange-vegan country, because there is a lot of vegan restaurants and vegan options in menu the others (for example Warsaw is the second city, which has the most of vegan restaurants), but there is very few, almost no vegan products in the stores. These are AMAZING! Tastes like it’s parents are a ginger snap and a pumpkin pie. We’re glad you like them, Kelly! Holy moly, these are just as divine as I was hoping. Used TJ cashew butter, almond flour (had no coconut flour) and added some vanilla protein powder. So flavorful! I hope they hold up in my pack for my bike rides. Otherwise I’ll probably just stuff them into dates which make a natural package. Did anyone else hear the tiny voice saying, “Poke some raisins into the center!” Wow, thank you Tiny Voice and Dana! Deeee-licious. I made this using almond flour (1/2 cup), sunflower butter and chia seeds, I doubled the golden milk seasoning, used 4TBS maple syrup and added a splash of vanilla extract. Delicious!! Super glad to have a ”portable” Golden milk snack! Thank you,Dana—your recipes are always fantastic! So, you don’t have to cook a cookie if it has coconut flour in it? Interesting. I think with regular flour, you have to cook it, or you could get sick…right? This blows my mind! Loved this! Used closer to 2.5-3 tbsp maple syrup, and about 1.5 tsp in my milk mix, and it came out great. Not too sweet but enough sweetness that I think many tastebuds can enjoy. I added more milk mix to it too, as the flour leaves it a bit drier and I wanted to try with more of the delicious ‘milk’. I also used a brand of coconut milk that is a staple for me but I’ll be trying with almond or almond x coconut next time. Only disappoint is these are tiny! I had to make two batches. You’ll get about 6-7 ‘regular’ sized balls, and since I made them again, around 9 smaller ones the other time. I used a scoop of NUZEST protein powder instead of coconut flour and they came out great! Love the flavor switch up to my usual snack bites! I think my 4 year old would love these! How much does the maple syrup affect the texture? I find cashew butter very sweet so wondering if I could leave out the syrup. I think leaving it out should be fine! Just add less flour. I love simple recipes! Never tried cashew butter. I usually use cashews on salad dressings: they’re the best dressings I made. Have to blend some and try the butter. Thank you for the recipe! Fantastic! I just made them with a few changes. I didn’t have cashew butter so I substituted almond butter. I didn’t have coconut flour so I used almond meal (I needed about 1 cup, just like you said, Dana). I also added a pinch of orange zest. I already ate two on the way to refrigerate them. Wow!!! Thanks, Dana! Love the idea to add orange zest! I used tahini and brown rice flour because that is what I had at the house. They turned out so good! It was hard not to just eat all the mix before I put the coconut rolled ones into the fridge! What a great snack thank you for this recipe! Do you think I could sub in some chia seeds for the hemp seeds?? I haven’t used chia seeds too much so I wasn’t sure. Sure! It will add more crunch, but it should work. I used homemade cashew butter (plain, unsalted cashews blended in a Vitamix) and almond flour instead of coconut flour. I had to almost double the flour and the golden milk mix. Overall tasty and super simple and easy to make! A very quick recipe to make, and satisfying. Since I didn’t have cashew butter, I substituted the tahini as suggested. 2 thumbs up! These look amazing and I’m looking forward to trying them out. Also, thank you for thinking about those of us with but allergies. Such a simple thing but it makes my heart glad. This looks WONDERFUL! Do you think I could do it with another kind of flour? I’m allergic to both almonds and coconut. Thanks! I think oat flour would be good, or another nut or seed meal! Hello and I’m Susan Parker. I don’t particularly like using Maple Syrup as I’m a former Type 2 diabetic. However, because Dates are low on the Glycemic Scale as to the higher values in Syrups, would it be acceptable to sub the Dates (as in a Date Paste or Date Butter). I’m thinking the Cashew Butter and the Coconut Flour would need to be decreased just a bit to accommodate for the denser texture of the Date Paste/Butter as opposed to the Maple Syrup. I’m thinking of giving this a try tonight and seeing what the results look like. Also before in other recipes, ive cut back on the Coconut Flour and have sifted into it the Chick Pea Flour to add an extra boost of protein. I think that would work! Just play with the ratios to get the right texture! 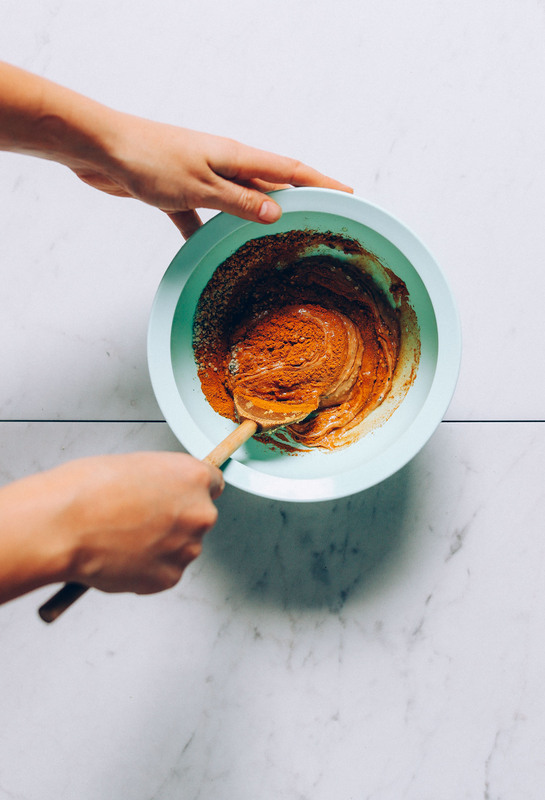 Do you have a favorite cashew butter or do you make it yourself? I actually use Trader Joe’s brand, but it’s easy to make your own. Just blend roasted or raw cashews in a food processor or high speed blender until creamy, occasionally scraping down sides as needed. Great idea with the Golden Milk theme!